Most bushwalkers probably know of the Common Native Cherry (Exocarpos cupressiformis) as a bush food but it is still worth blogging about. Whenever I see ripe fruit on the Common Native Cherry, I always pluck some for refreshment. While we certainly don’t NEED native tidbits to supplement our well stocked lunch boxes of sandwiches, fruits and nuts, it is a most sublime feeling to appreciate what the bush has to offer. 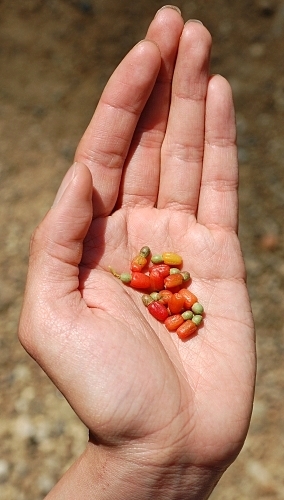 The act of harvesting wild edible fruit, little as there may be, feels like a sort of communion. I give thanks for such opportunities. 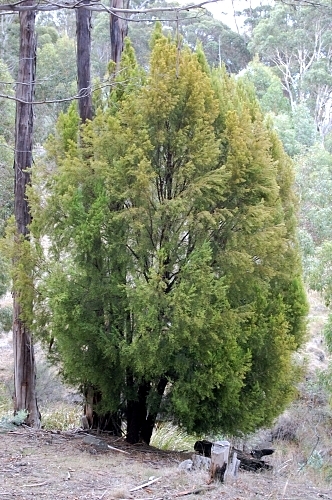 The Common Native Cherry grows common in open eucalypt woodland. In it’s ideal state, the Common Native Cherry is a dense small dull green conical tree attaining a height of no more than 8 m. Most of the time though, a good proportion of the fruit-bearing branches are well within reach. Talk about low hanging fruit. The branches are green, groovy and leafless, giving it the same general appearance of some native Cypress Pines (Callitris spp.). In addition, the Common Native Cherry sometimes has wooden galls as well, giving the impression that it bears cones. However, small spikes of minute yellow flowers present on the branches at most if not all times of the year will distinguish it immediately. Also, the fruits of this tree are unmistakable. Usually only one flower out of the spike is fertilized and the fruit is really only the hard ovoid structure held on the end of a fleshy receptacle which gets more succulent and redder as the fruit ripens. In many ways these fruits resemble minute versions of the curious fruits of cashew nuts (Anacardium occidentale). The edible part is not actually the fruit but the red ripened and swollen receptacle, which has a sweet taste (See my DISCLAIMER). I don’t often see ripe ‘fruits’ on all trees in any one given locality so there must be some staggering of fruit production. While it is not very apparent, the Common Native Cherry is actually a semi-parasitic plant which parasitises on the roots of eucalypt trees around it. It might be surprising for some to learn that the Common Native Cherry is from the Santalaceae, the same botanical family that bears the well known sandalwood (Santalum album). Macabre is the thought that the ‘blood’ of the Common Native Cherry’s victims goes into the making of the succulent fruits we enjoy. Sap-sucker or not, I imagine that the Common Native Cherry must have been to Tasmanian aborigines what wild blackberries are to Europeans. Wild sweet juicy fruit is good anywhere! 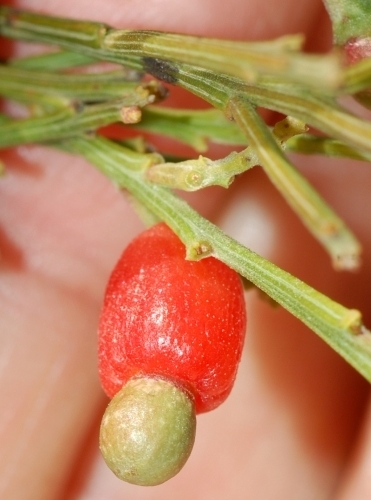 This entry was posted in Bush Tucker, Trees and tagged Common Native Cherry, Exocarpos, Exocarpos cupressiformis, native cherry, sandalwood, sandalwood fmily, Santalaceae. Bookmark the permalink. This is an Amazing tree…it is Endangered hear in Wilmot…a disease killing the native Eucalyptus tree (the Peppermint gum) is also killing this native cherry tree due to forest industries mono-culture development in Tasmania. To whom it may concern,I am a teacher of horticulture at TAFE NSW, Coffs Harbour education campus, I was discussing with some students about how parots get drunk eating the fermented fruit of some Australian native plants.One student mentioned that Tasmania has one tree that has fruit that ferments, and that the native aboriginals once ate them. I am interested to know more,can you help. We (my wife and two daughters are planning a holiday to Tassie at the end of the year, and anything hort related is good. Cheers, Clint Burton. I have recently acquired a property at Dromedary overlooking the Derwent River. When I first discovered this little gem, I could not initially identify it but was fascinated by the small but very sweet fruit. A friend and colleague identified it for me and advised me that it was impossible to propogate and it only grows parasitically from the roots of host trees by some remote chance. I frantically had a large feed of the fruit and started inserting the left-over pips into cracks in old stumps and recently culled berry bushes in the hope that I could prove him wrong. During this process I discovered another 8 trees including a cluster of 5. I will continue in my attempts to propagate and as a former resident of Wilmot Road, if I find a reliable method I will try to duplicate the process in the hope that the disease killing them in Wilmot will have died out and the population may be re-astablished.